The match will resume Saturday under the same playing conditions. Novak Djokovic and Rafael Nadal will resume their Wimbledon semi-final battle under the Centre Court roof despite clear blues skies and temperatures pushing 30 degrees on Saturday. 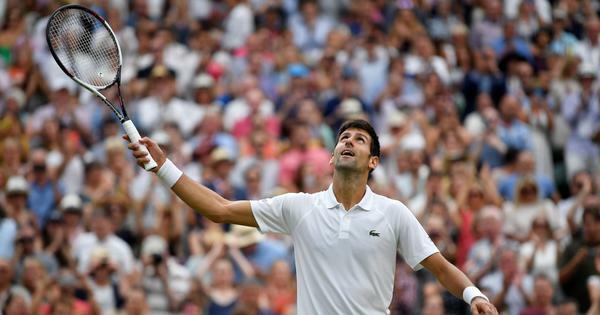 Three-time champion Djokovic grabbed a 6-4, 3-6, 7-6 (11/9) lead in the pair’s 52nd meeting when the match was halted just after 11 pm on Friday due to a strict curfew agreed between the All England Club and local residents. The semi-final will resume at 1 pm, organisers said, and under the roof as those were the conditions in which it began. It will probably mean a delay to the women’s singles final between seven-time champion Serena Williams and Angelique Kerber which is due to begin at 2 pm and with the roof open. The eagerly-awaited confrontation between world number one Nadal, the champion in 2008 and 2010, and Djokovic, the winner in 2011, 2014 and 2015, only started after 8pm (1900GMT) on Friday. That was due to the opening semi-final between Kevin Anderson and John Isner taking 6 hours and 36 minutes to complete. Anderson triumphed 7-6 (8/6), 6-7 (5/7), 6-7 (9/11), 6-4, 26-24 in the second longest Grand Slam match ever played. Djokovic, starting with a 26-25 career advantage over Nadal, flourished in the fast conditions under the roof, breaking in the seventh game of the opening set. But Nadal, chasing an 18th Grand Slam crown and in his first Wimbledon semi-final since finishing runner-up to Djokovic in 2011, then saved five break points in the second set to level the contest. Nadal had three set points in the third set tiebreaker – one of them created off a lung-busting 23-shot rally. However, he was unable to convert and Djokovic pounced to claim the set after almost three hours on court. Twelfth sees Djokovic is seeking a fifth final at the All England Club, 22nd at the majors and 13th Slam title. For Nadal, victory would put him in a sixth Wimbledon final and 25th at the majors. Djokovic has already hit 42 winners to Nadal’s 39 but has converted just two of 10 break points. Meanwhile, Anderson and Isner called for Grand Slam chiefs to introduce a cut-off point for final set marathons. The final set of their Friday epic lasted almost three hours. “I hope this is a sign for Grand Slams to change. I really hope we can look at this, because at the end you don’t feel great,” said Anderson who has been on court for over 21 hours at these championships. Isner previously won the longest ever Grand Slam singles match against Nicolas Mahut, lasting 11 hours and five minutes over three days in the 2010 Wimbledon first round. The 33-year-old agreed with Anderson that Wimbledon, the Australian Open and Roland Garros should fall in line with the US Open and introduce a tiebreak in the final set. Isner finished the tournament with a record 221 aces. Until Friday, he had not dropped serve until Anderson halted that run at 110 service games in the third set. Friday’s marathon was the longest semi-final ever played at Wimbledon, surpassing the four hours 44 minutes it took Djokovic to beat Juan Martin del Potro in 2013. It also passed the previous mark for the second longest match at a Slam of six hours and 33 minutes which Fabrice Santoro spent seeing off Arnaud Clement in the 2004 French Open. “It feels like it’s a draw but somebody has to win. I really feel for John,” added Anderson, who has now made his second final at a Slam after finishing runner-up to Nadal at last year’s US Open. Anderson finished the match with 49 aces and 118 winners; Isner had 53 aces and 129 winners. He had break points in the 15th, 21st and 35th games of the decider before taking victory when a weary Isner, who had needed treatment for blisters on his right hand, hit long. “It just seems cruel and unusual punishment for these guys,” former champion John McEnroe said on the BBC.